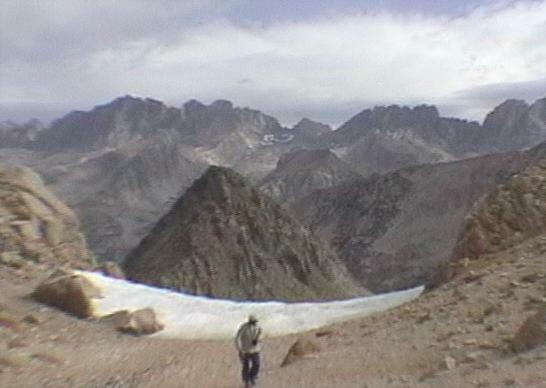 the Plan: irrelevant by now - we should be on the Muir Trail! Clearly, we were well behind schedule again, since we had not crossed Cataract Pass. Bill Finch's web page implied that Cataract was the toughest pass he had crossed in the vicinity, and after our experience at Dumbbell that caused a lot of concern on out part! Nevertheless, we swiftly worked uphill to the pass, reaching it in less than an hour. Our view to the NE was one that confirmed his experience: a near-vertical snowfield blocked the direct route, and only part of Amphitheater Lake could be seen below us. It would indeed be a tough few hours coming up! On the other hand, the view of the Palisades was even better than from Dumbbell Pass, and the gentle notch of Knapsack Pass was clear below Columbine Peak to our north. Whatever came next, the view was a special one. We worked left around the snowfield, then crossed it at a level point and continued attacking the talus on the right side. We finally reached a patch of green, went right again and worked down to the lake, where more large talus kept us hopping to the very north edge of the lake. While I had hoped that we would camp here so I could explore the basin to the SE, a few glances and pictures were the best I could do this trip. After rest and a quick meal, we headed north in search of the old path down to Deer Meadow. Secor said the basin above the trail was 'easy', but again we were forced to disagree with his evaluation. Many ramps both left and right led us down by the creek, only to force us higher again where the trees thickened just above 10000 feet. We were forced high and to the right, and we were questioning our sanity when we saw a large duck atop the ridge. From the ridgetop we found a small valley that ultimately solved the puzzle, with merely another large talus-field between us and the path now visible below. Although we lost it several times before reaching Palisade Creek, we were becoming accustomed to such inconveniences now; we simply went by the best way until the path chose to come to us again. A lot of blowdown near the valley floor led to more circuitous walking, but we finally reached Palisade Creek and rewarded our feet with a crossing of the chilly stream. After a half-hour of head-shaking, eating and foot-resting, we recognied that we still had some walking time left. Since we were exiting at North Lake in three days, we resumed our travels on the hard-to-lose Muir Trail. After some time we reached the junction of Palisade Creek and the Middle Fork Kings and set up camp. For the first time since day one, we were not alone: two couples shared the camp area with us, and others were in more secluded spots nearby. No rain intruded here, and a group of four mule deer wandered through the area at dusk.